PRODUCT FEATURES: ✔ 50 HIGH QUALITY BEAD NECKLACES (25 BRIGHT BLUE & 25 BRIGHT PINK) ✔ INCLUDES A BONUS CUSTOMIZABLE GAME FOR USE WITH THE BEADS! ✔ EASY PARTY FAVOR GIVEAWAY! ✔ IDEAL FOR BABY SHOWER, GENDER REVEAL PARTY, AND OTHER THEMED PARTIES ✔ PINK AND BLUE COLOR SCHEME DESIGNED TO MATCH YOUR THEME ✔ CARDBOARD BOX INCLUDED FOR EASY BEADS STORAGE ✔ HIGH QUALITY, DURABLE, AND THICK CARDSTOCK PRINTED GAME, INK WILL NOT FADE OR BLEED ✔ VERSATILE BEADS TO BE USED AT VARIOUS EVENTS ✔ 100% MONEY BACK GUARANTEE - RECOMMENDED FOR EVERYONE! 50 LARGE 7mm Beads - Large High Quality Blue and Pink beads will catch the attention of your guests and keep them entertained all evening! Decor & Party Favor Use - Our beads and cardstock triangle game will add to the Decor of your event! Give away the beads as a party favor at the end of the night! Or reuse them for your next event! Box included for storage. Unique Bonus Game Design! - Shhhhh Don’t Say Baby! Unique game design is fully customizable to your liking. Incorporate names or even your own inside jokes! 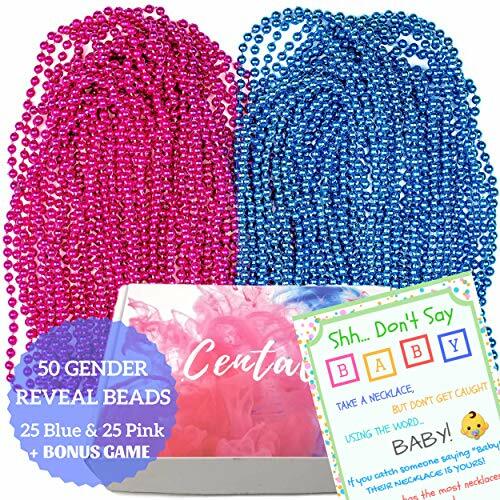 Versatile Game Modes - Centali’s Gender Reveal Beads Set is versatile for gameplay! Use the template, or don’t! The choice is yours. If you do use the included game, play with one side, play with the other side, or play using both sides of the trifold game!! Various Events and Themes – Ideal for your Baby Shower, Gender Reveal Party, Boy’s Birthday, Girl’s Birthday, Themed Parties, and so much more!! CENTALI’S PROMISE: CONFIDENCE IN WHAT WE SUPPLY - 100% MONEY BACK GUARANTEE. IF YOU ARE NOT COMPLETELY SATISFIED WE WILL REFUND YOUR PURCHASE. NO QUESTIONS ASKED.